As a movie fans, you may got many Hollywodd collections in the past years. However, Hollywood wants you to buy its movies on DVD and Blu-ray, but it also wants to control what you do with them once you get home. Hollywood has the right to protect it’s intellectual property, we also believe that consumers have the right to enjoy the property they purchase. In this article, we show you how to make a backup of digital copy, so that you can transfer the Hollywoood contents to other medium, for conveniently playback. [Is it legal to backup Blu-ray or DVD?] If you buy a movie on a disc, then you should have the right to make a back-up copy, or transfer the content to another medium, like a hard drive. Of course, you don’t have the right to distribute or sell copies of the movies you buy. If you are looking to make digital backups of your favorite Hollywood Blu-ray movies, you can find few better tools than MakeMKV, a freeware video transcoder that is quick and easy to use. Note: A Blu-ray will make a huge file, so we recommend you have between 30 and 60 GB of free hard drive space. 2. Put a Blu-ray movie into your Blu-ray drive (if you don't have one, get one first), and click the Blu-ray button in the middle of the screen. MakeMKV can rip copies of your Hollywood Blu-ray movies to MKV file on both PC and Mac. 4.When the software is done, select the location for your movie in the Output Folder menu box, click Make MKV, and wait. Expect an average Blu-ray disc to take at least 30 minutes to rip to your hard drive. It depends. MakeMKV output MKV files ONLY! If you wanna convert the MKV rip to more common format MP4, the Handbrake should be the best choice. Ripping a Hollywood Blu-ray disc to watch on a small-screen and/or limited-resolution device is somewhat senseless: The extra pixels in the Blu-ray will be lost due to the limited resolution, or you won’t see the benefit of them due to the small screen size. You’ll get very good results—and get done much faster—by using the DVD version of the movie. There are lots of programs available to help you do the DVD ripping task, but we bet you favorite program is the HandBrake, a completely free DVD ripper software wit a high reputation. Note: To rip Hollywood DVDs, you'll need the DVD43 plug-in, which circumvents the publisher's digital rights management technology. 1. Make HandBrake downloaded and installed on your computer. 2. Inserted Hollywood DVD into DVD drive, then click "Source" button to do the disc loading. You can click "Title" drop-down button under "Source" section to choose the title you want to rip. If you hope to rip the main movie, just select the title with the longest run time. 3. Under "Destination" option, you can click "Browse" button to navigate to where you want to save the output file, and meanwhile type in a file name in the pop-up menu. Then, click "OK". 4. Under "Output Settings" section, you can choose desired output format (MP4 or MKV) from "Container" box. If needed, you can do some settings under "Picture", "Filters", "Video", "Audio", "Subtitles", "Chapters" and "Advanced" sections. 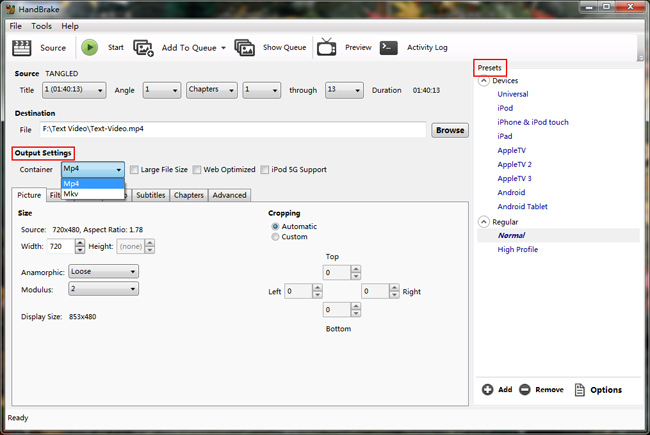 HandBrake offers some handy presets on the right side of the main interface. 5. 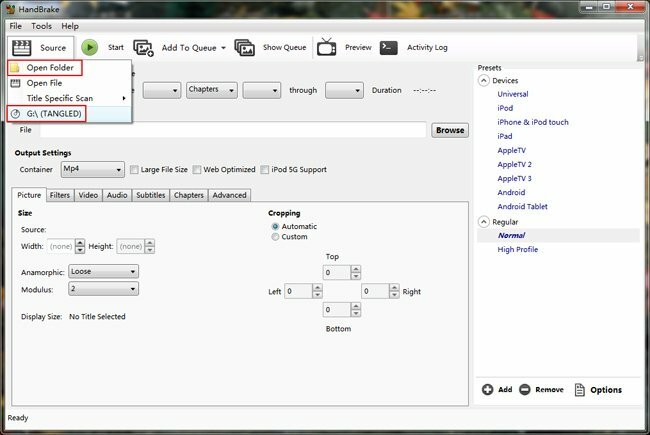 When done with all settings, you can click "Start" button on program top menu bar to start to convert DVD with HandBrake. An all-in-one converter: Do conversion between video, audio, DVD and Blu-ray disc. 1. Convert videos to / from various formats. 2. Transcode videos for playing on multiple players and devices. 3. Convert DVD/Blu-ray movies to 4K/1080P/720P HD videos in various HD formats. 4. Backup DVD/Blu-ray disc without quality loss. 5.Create 3D movies from 2D videos/DVD/Blu-ray with abundant 3D effects.